#5 – Thank God for the Good Guys in Boston! One Down and One to Go. | It's the Women, Not the Men! #5 – Thank God for the Good Guys in Boston! One Down and One to Go. One down (black hat) and one to go (white hat). Revenge is sweet. Two demons on the prowl. 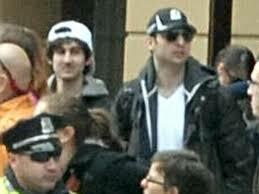 Terrorists who trickled in from country of Chechnya, but American city of Boston will beat them both!